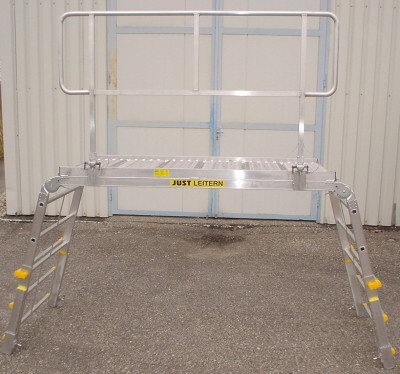 The Folding Rescue Platform has several special design features; allowing for ease of use and for it to form a very strong and safe working platform; from 0.8mtr to 1.75mtr high. Foot pads: Wide plates that clip onto the bottom of the legs allowing for the weight to be better distributed on soft ground. 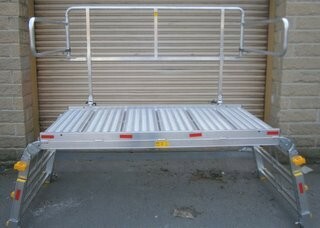 Rail Axles: A pair of axles that are easily clipped onto the top part of the platform; the platform is then turned over, both legs then provide a means of pushing the unit. 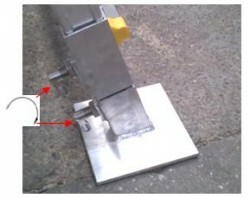 The small small cast wheels allow for very easy movement on railway lines, and the fitted brakes fix in place when required. Platform unfolded and partially extended. (Heights:- min 80cm. max1.75mtr). 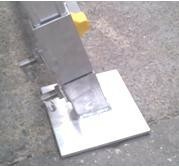 Platform side rail, with step guards unfolded. 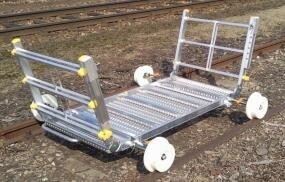 With Rail Axles fitted, for use on Rail lines. Easily fitted without the use of any tools, with brakeing system. Clips on and off without any tools and is fully adjustable with the leg. 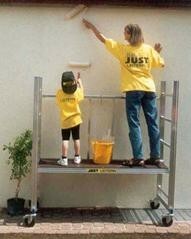 Widely used in Europe, as this is made up using; 4 x Stick ladders. 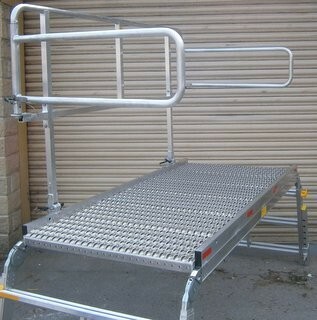 As with all our Platforms and ladders, we can attach addittional features and attachments as required to make the items bespoke for your requirements. Please ask about this service. 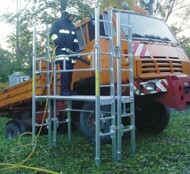 All our Platforms and Rescue towers are manufacturerd by our Austrian partners.